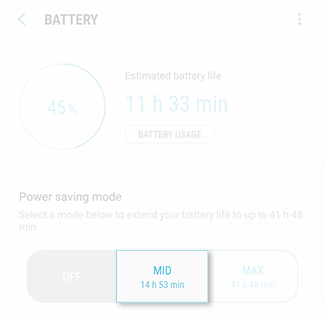 Galaxy Note8: How do I use the power saving modes on my Samsung Galaxy Note8 (SM-N950W)? Don’t you hate it when your battery dies right in the middle of an important call? 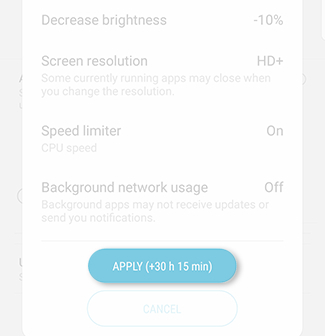 Thankfully, your Note8 comes equipped with defenses against the dreaded “Low Battery” warning. 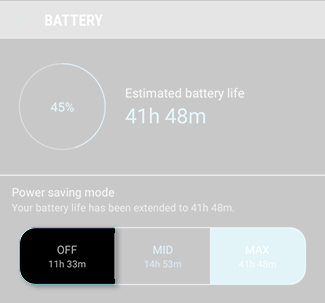 Say sayonara to a drained battery by using a power saving mode. Note: Need your phone to last for a presentation at school tonight but have to share videos and slides with your teammates on apps this afternoon? 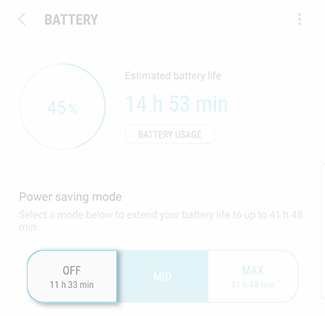 Turn on Medium power saving mode to make sure your battery lasts. You’ll still have access to all functions in this mode. 5 To turn on Medium power saving mode, touch MID. Note: You can customize the Power saving mode options by touching CUSTOMIZE. 7 To turn off Medium power saving mode, navigate back to Power saving mode from settings and then touch OFF. Note: This mode is perfect for overnight or times you won’t be using your phone. Try it, and see how long your battery lasts. Just follow these steps. 5 To turn on Maximum power saving mode, touch MAX. 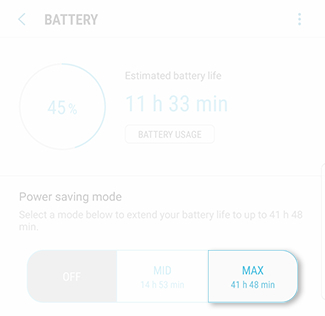 7 To turn off Maximum power saving mode, touch Settings. • Use Samsung supplied USB/charging cables and avoid third-party accessories. • Ensure the USB/charging cable is connected securely and is not being blocked by your phone cover or case. • Make sure the battery or charging indicator appears on the phone's display when the USB/charging cable is connected. • Use the outlet on your wall instead of your computer for best results. • Disconnect the phone from the USB/charging cable once the battery is fully charged. Galaxy Note8: How do I charge my Samsung Galaxy Note8 (SM-N950W)?